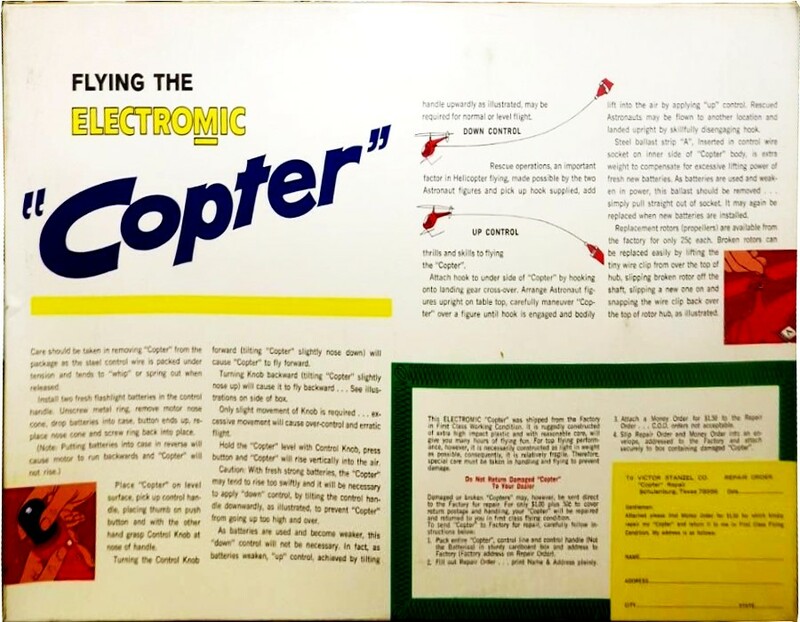 For most people my age (born in 1958), the first experience with a 'real' flying model helicopter was this ElectroMic "Copter" by Stanzel. I finally acquired one via eBay for a fair price. 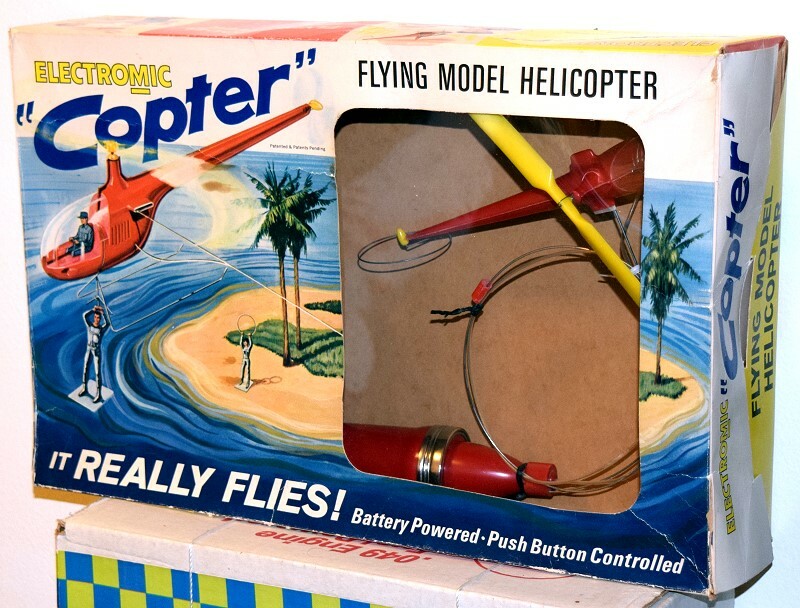 The "Copter" uses two D-cell batteries in the plastic handle to power a motor, also in the handle, which in turn drives the center wire of a coaxial cable that connects to the helicopter rotor. Flying the Copter is a matter of pressing the power button and then manipulating the handle to direct the model in flight. 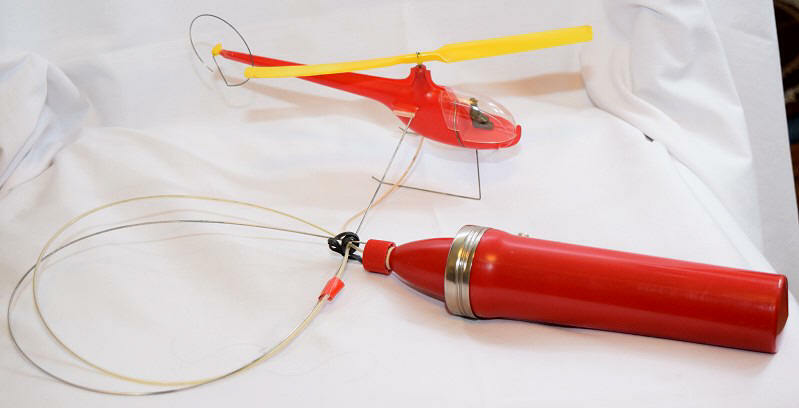 With fully charged batteries, the helicopter generates a lot of lift and requires angling the control cable downward to prevent the thing from performing the equivalent of a wingover. Forward and reverse flight involve angling the controller left and right. After a few moments of practice, precise control is fairly easy. I also ran across this advertisement in the 1969 edition of Montgomery Ward's Christmas catalog. It has not just the helicopter, but also the airplane and Lunar Bug versions. I might have also had the airplane, but definitely not the flying saucer.